Nick Gebelt "was absolutely meticulous with my case, making sure to handle my concerns by asking questions"...He has an encyclopedic knowledge of the bankruptcy code and working with him is like working with a good friend or uncle. "What really stands out about Nicholas Gebelt, is how accessible he is. In all my experiences with attorneys over the years, I've never had one who responds as quickly and thoroughly as Gebelt." Mr. Gebelt is not only a bankruptcy attorney, he is a board-certified bankruptcy law specialist, certified by the California State Bar’s Board of Legal Specialization. Although there are over 300,000 attorneys licensed by the California State Bar to practice law, there are fewer the 200 board-certified bankruptcy law specialists. The certification process is difficult and rigorous ― which is why there aren’t very many board-certified bankruptcy law specialists ― and is designed to produce bankruptcy attorneys of the highest caliber. 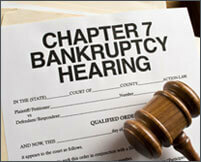 Chapter 13 Bankruptcy Yields Results Not Possible In A Chapter 7 Bankruptcy. Chapter 13 bankruptcy will reorganize your debt into a partial or complete repayment plan. It is often used by people with higher income or assets with significant equity. Bankruptcy Attorney Nicholas Gebelt received his law degree from the University of Virginia, one of the top 10 law schools in the nation. He has a Ph.D. in mathematics from UCLA and has worked as a professor at several universities. As a math professor, Mr. Gebelt can clearly explain complex ideas to those without a technical background. Working as an educator, he developed a great deal of patience, so he’s willing to take the time necessary to ensure that his clients understand the relevant bankruptcy law and what he is doing for them. Mr. Gebelt is very responsive to client’s questions. He returns client calls and emails quickly. He doesn’t leave the client wondering what’s going on with the case.